To celebrate England‘s triumphant march towards the final of Euro 2012 (think positive! 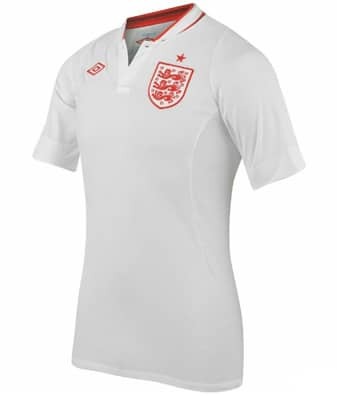 ), we are giving away an Official Umbro England Home Shirt for each game that England remain in the tournament. Simply click Like below to enter the Facebook competition. Increase your chances of winning by also entering the via Twitter. Follow on Twitter here and then Copy and Send this Tweet. The Prize we are giving away is an Adult Size White England Home Short Sleeve Shirt ( RRP of £54.99). Winners will be able to request their size from the following choices: 38", 40", 42", 44", 46". Junior sizes are available on request and subject to availability. For the full Competition Rules please click here.